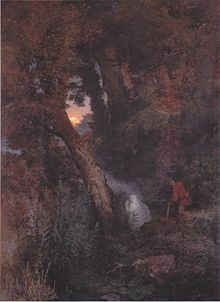 An 1882 oil painting of a will-o'-the-wisp by Arnold Böcklin. In folklore, a will-o'-the-wisp, will-o'-wisp or ignis fatuus (pronounced [ˈfa.tu.us]; Medieval Latin for "fool's fire") is an atmospheric ghost light seen by travelers at night, especially over bogs, swamps or marshes. The phenomenon is known in English folk belief, English folklore and much of European folklore by a variety of names, including jack-o'-lantern, friar's lantern, hinkypunk and hobby lantern, and is said to mislead travelers by resembling a flickering lamp or lantern. In literature, will-o'-the-wisp sometimes have a metaphorical meaning, e.g. describing a hope or goal that leads one on but is impossible to reach, or something one finds sinister and confounding. Will-o'-the-wisp appear in folk tales and traditional legends of numerous countries and cultures; notable will-o'-the-wisp include St. Louis Light in Saskatchewan, Marfa lights of Texas, the Naga fireballs on the Mekong in Thailand, and the Hessdalen light in Norway. While urban legends, folkore, and superstition typically attribute will-o'-the-wisps to ghosts, fairies, or elemental spirits, modern science often explains them as natural phenomena such as bioluminescence or chemiluminescence, caused by the oxidation of phosphine (PH3), diphosphane (P2H4), and methane (CH4) produced by organic decay. The term "will-o'-the-wisp" comes from "wisp", a bundle of sticks or paper sometimes used as a torch, and the name "Will", thus meaning "Will of the torch". The term jack-o'-lantern (Jack of the lantern) originally referred to a will-o'-the-wisp. In the United States, they are often called "spook-lights", "ghost-lights", or "orbs" by folklorists and paranormal enthusiasts. Folk belief attributes the phenomenon to fairies or elemental spirits, explicitly in the term "hobby lanterns" found in the 19th century Denham Tracts. In her book A Dictionary of Fairies, K. M. Briggs provides an extensive list of other names for the same phenomenon, though the place where they are observed (graveyard, bogs, etc.) influences the naming considerably. When observed in graveyards, they are known as "ghost candles", also a term from the Denham Tracts. The names will-o'-the-wisp and jack-o'-lantern are explained in etiological folk-tales, recorded in many variant forms in Ireland, Scotland, England, Wales, Appalachia, and Newfoundland. In these tales, protagonists named either Will or Jack are doomed to haunt the marshes with a light for some misdeed. One version from Shropshire is recounted by Briggs in A Dictionary of Fairies and refers to Will the Smith. Will is a wicked blacksmith who is given a second chance by Saint Peter at the gates of heaven, but leads such a bad life that he ends up being doomed to wander the earth. The Devil provides him with a single burning coal with which to warm himself, which he then uses to lure foolish travellers into the marshes. An Irish version of the tale has a ne'er-do-well named Drunk Jack or Stingy Jack who, when the Devil comes to collect his soul, tricks him into turning into a coin, so he can pay for his one last drink. When the Devil obliges, Jack places him in his pocket next to a crucifix, preventing him from returning to his original form. In exchange for his freedom, the Devil grants Jack ten more years of life. When the term expires, the Devil comes to collect his due. But Jack tricks him again by making him climb a tree and then carving a cross underneath, preventing him from climbing down. In exchange for removing the cross, the Devil forgives Jack's debt. However, no one as bad as Jack would ever be allowed into heaven, so Jack is forced upon his death to travel to hell and ask for a place there. The Devil denies him entrance in revenge but grants him an ember from the fires of hell to light his way through the twilight world to which lost souls are forever condemned. Jack places it in a carved turnip to serve as a lantern. Another version of the tale is "Willy the Whisp", related in Irish Folktales by Henry Glassie. Séadna by Peadar Ua Laoghaire is yet another version—and also the first modern novel in the Irish language. "Feu follet" redirects here. For other uses, see Feu follet (disambiguation). In Trinidad and Tobago a Soucouyant is a 'Fire Ball Witch' that is literally a witch that takes on the form of a flame at night. This spirit is, like the other versions, evil -- It enters homes through any gap it can find, and drinks the blood of its victims. Aleya (or marsh ghost-light) is the name given to a strange light phenomena occurring over the marshes as observed by Bengalis, especially the fishermen of West Bengal and Bangladesh. This marsh light is attributed to some kind of marsh gas apparitions that confuse fishermen, make them lose their bearings, and may even lead to drowning if one decided to follow them moving over the marshes. Local communities in the region believe that these strange hovering marsh-lights are in fact Ghost-lights representing the ghosts of fisherman who died fishing. Sometimes they confuse the fishermen, and sometimes they help them avoid future dangers. Chir batti (ghost-light), also spelled chhir batti or cheer batti, is a strange dancing light phenomenon occurring on dark nights reported from the Banni grasslands, its seasonal marshy wetlands and the adjoining desert of the marshy salt flats of the Rann of Kutch near Indo-Pakistani border in Kutch district, Gujarat State, India. Local villagers have been seeing these sometimes hovering, sometimes flying balls of lights since time immemorial and call it Chir Batti in their Kutchhi–Sindhi language, with Chir meaning ghost and Batti meaning light. Danes, Finns, Swedes, Estonians, Latvians, Lithuanians, and Irish people and amongst some other groups believed that a will-o'-the-wisp also marked the location of a treasure deep in ground or water, which could be taken only when the fire was there. Sometimes magical tricks, and even dead man's hand, were required as well, to uncover the treasure. In Finland and several other northern countries, it was believed that early autumn was the best time to search for will-o'-the-wisps and treasures below them. It was believed that when someone hid treasure, in the ground, he made the treasure available only at the Saint John's Day, and set will-o'-the-wisp to mark the exact place and time so that he could come to take the treasure back. For then he could be fulfilled with treasures. Also related, the Pixy-light from Devon and Cornwall is most often associated with the Pixie who often has "pixie-led" travellers away from the safe and reliable route and into the bogs with glowing lights. "Like Poltergeist they can generate uncanny sounds. They were less serious than their German Weisse Frauen kin, frequently blowing out candles on unsuspecting courting couples or producing obscene kissing sounds, which were always misinterpreted by parents." Pixy-Light was also associated with "lambent light" which the Old Norse might have seen guarding their tombs. In Cornish folklore, Pixy-Light also has associations with the Colt pixie. "A colt pixie is a pixie that has taken the shape of a horse and enjoys playing tricks such as neighing at the other horses to lead them astray". In Guernsey, the light is known as the faeu boulanger (rolling fire), and is believed to be a lost soul. On being confronted with the spectre, tradition prescribes two remedies. The first is to turn one's cap or coat inside out. This has the effect of stopping the faeu boulanger in its tracks. The other solution is to stick a knife into the ground, blade up. The faeu, in an attempt to kill itself, will attack the blade. In modern science, it is generally accepted that will-o'-the-wisp phenomena (ignis fatuus) are caused by the oxidation of phosphine (PH3), diphosphane (P2H4), and methane (CH4). These compounds, produced by organic decay, can cause photon emissions. Since phosphine and diphosphane mixtures spontaneously ignite on contact with the oxygen in air, only small quantities of it would be needed to ignite the much more abundant methane to create ephemeral fires. Furthermore, phosphine produces phosphorus pentoxide as a by-product, which forms phosphoric acid upon contact with water vapor, which can explain "viscous moisture" sometimes described as accompanying ignis fatuus. Many times candles & small fires appeare in the night, and seeme to runne up and downe... Sometime these fires goe alone in the night season, and put such as see them, as they travel by night, in great feare. But these things, and many such lyke have their naturall causes... Natural Philosophers write, that thicke exhilations aryse out of the earth, and are kindled. Mynes full of sulphur and brimstone, if the aire enter unto it, as it lyeth in the holes and veines of the earth, will kindle on fier, and strive to get out. In 1776, Alessandro Volta first proposed that natural electrical phenomena (like lightning) interacting with methane marsh gas may be the cause of ignis fatuus. This was supported by the British polymath Joseph Priestley in his series of works Experiments and Observations on Different Kinds of Air (1772–1790); and by the French physicist Pierre Bertholon de Saint-Lazare in De l’électricité des météores (1787). The will-o'-the-wisp phenomena may occur due to the bioluminescence of various forest dwelling micro-organisms and insects. The eerie glow emitted from certain fungal species, such as the honey fungus, during chemical reactions to form white rot could be mistaken for the mysterious will-o'-the-wisp or foxfire lights. There are many other bioluminescent organisms that could create the illusions of fairy lights, such as fireflies. Light reflecting off larger forest dwelling creatures could explain the phenomena of will-o'-the-wisp moving and reacting to other lights. The white plumage of Barn owls may reflect enough light from the moon to appear as a will-o'-the-wisp; hence the possibility of the lights moving, reacting to other lights, etc. ^ Trevelyan, Marie (1909). Folk-Lore and Folk-Stories of Wales. London. p. 178. ISBN 9780854099382. Retrieved September 18, 2010. ^ "Will-o'-the-wisp". The American Heritage Dictionary of the English Language. Houghton Mifflin. 2007. ^ Harper, Douglas. "Jack o'lantern (n.)". Online Etymology Dictionary. Archived from the original on 2013-09-27. Retrieved 9 May 2013. ^ Wagner, Stephen. "Spooklights: Where to Find Them". About.com. Archived from the original on 2007-10-22. Retrieved 2007-12-08. ^ Floyd, Randall (1997). "Historical Mysteries: Ghostly lights as common as dew in Dixie". The Augusta Chronicle. Retrieved December 8, 2007. ^ "Ghost Lights and Orbs". Moonslipper.com. Archived from the original on March 11, 2007. Retrieved November 18, 2011. ^ Hoerrner, Mark (2006). "History of the Jack-O-Lantern". buzzle.com. Retrieved May 9, 2007. ^ Leslie O'Malley (2015-10-15). "HISTORY OF THE JACK O'LANTERN AND THE LEGEND OF STINGY JACK". authenticireland.com. Retrieved 2017-12-11. ^ Melton, J. Gordon (1999). The Vampire Book. Visible Ink Press. p. 7. ISBN 978-1578592814. ^ "North American Vampires". VampireUnderworld.com. 2012-03-25. ^ "O BOITATÁ" [The BOITATÁ]. Terrabrasileira.net (in Portuguese). Archived from the original on December 18, 2009. Retrieved November 18, 2011. ^ Pandey, Ambarish (April 7, 2009). 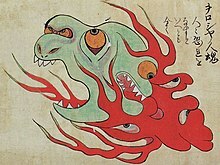 "Bengali Ghosts". Pakistan Times. Archived from the original on October 25, 2011. Retrieved November 18, 2011. ^ "Blog post by the author Saundra Mitchel of the novel "Shadowed Summer" at Books Obsession". Booksobsession.blogspot.com. October 9, 2009. Retrieved November 18, 2011. ^ a b D V Maheshwari (August 28, 2007). "Ghost lights that dance on Banni grasslands when it's very dark". The Indian Express. Archived from the original on January 14, 2009. ^ Mizuki, Shigeru. "Graphic World of Japanese Phantoms". 講談社, 1985. ISBN 978-4-06-202381-8 (4-06-202381-4). ^ "lambent - alphaDictionary * Free English On-line Dictionary". Alphadictionary.com. Retrieved November 18, 2011. ^ "House Shadow Drake - Water Horses and Other Fairy Steeds". Shadowdrake.com. Archived from the original on September 27, 2011. Retrieved November 18, 2011. ^ "Colypixy". Pandius.com. Retrieved November 18, 2011. ^ Folklore of Guernsey by Marie de Garis (1986) ASIN: B0000EE6P8. ^ William Grant Stewart (1823). The Popular Superstitions and Festive Amusements of the Highlanders of Scotland. pp.161-162. ^ Alasdair Alpin MacGregor (1937). The Peat Fire Flame: Folktales and Traditions of the Highlands and Islands. Moray Press. pp. 284-285. ^ John Gregorson Campbell (1902). Witchcraft and Second Sight in the Highlands and Islands of Scotland. James MacLehose and Sons. pp. 169-172. ^ John Gregorson Campbell (1900). Superstitions of the Highlands and Islands of Scotland. James MacLehose and Sons. pp. 6-7. ^ a b c d e Pettigrew, John D. (March 2003). "The Min Min light and the Fata Morgana. An optical account of a mysterious Australian phenomenon" (PDF). Clin Exp Optom. 86 (2): 109–20. doi:10.1111/j.1444-0938.2003.tb03069.x. PMID 12643807. ^ Joris Roels & Willy Verstrae (2001). "Biological formation of volatile phosphorus compounds" (PDF). Bioresource Technology. 79 (3): 243–250. doi:10.1016/S0960-8524(01)00032-3. PMID 11499578. Archived from the original (PDF) on 2006-09-19. ^ Lavatar, Ludwig (1596). Of ghostes and spirites, walking by night: and of straunge noyses, crackes, and sundrie forewarnings: which commonly happen before the death of men: great slaughters, and alterations of kingdoms. Blough-Weis Library Susquehanna University. Thomas Creede. pp. 51–52. ^ Ciardi, Marco (2000). "Falling Stars, Instruments and Myths: Volta and the Birth of Modern Meteorology" (PDF). In Fabio Bevilacqua & Lucio Fregonese. Nuova Voltiana: Studies on Volta and His Times. Editore Ulrico Hoepli. p. 43. ^ a b c d Tomlinson, Charles (1893). A. Cowper Ranyard, ed. "On Certain Low-Lying Meteors" (PDF). Knowledge: An Illustrated Magazine of Science. Simply Worded—Exactly Described. 16 (New Series, Vol. III): 46–48. ^ Owens J.G. (1891). "Folk-Lore from Buffalo Valley". Journal of American Folk-Lore. 4: 123–4. ^ a b Blesson, Louis (1832–1833). "Observations on the Ignis Fatuus, or Will-with-the-Wisp, Falling Stars, and Thunder Storms". The Edinburgh New Philosophical Journal. 14: 90–94. ^ a b c A. A. Mills (2000). "Will-o'-the-wisp revisited". Weather. 55 (7): 20–26. doi:10.1002/j.1477-8696.2000.tb04067.x. ^ a b Zalasiewicz, Jan (2007). Richard Twitchett, ed. "The spirit of biodiversity" (PDF). The Paleontology Newsletter (64): 20–26. Archived from the original (PDF) on July 27, 2011. ^ a b Luigi Garlaschelli & Paolo Boschetti. On the track of the will-o'-the-wisp (PDF). Dipartimento di Chimica Organica, Università di Pavia. ^ Persinger, Michael A. (1993). Perceptual and Motor Skills. "Geophysical variables and behavior: LXXIV. Man-made fluid injections into the crust and reports of luminous phenomena (UFO Reports) — Is the strain field an aseismically propagating hydrological pulse?". ^ Derr, J.S. (1993). Perceptual and Motor Skills. "Seasonal hydrological load and regional luminous phenomena (UFO reports) within river systems: the Mississippi Valley test.". ^ A Review of accounts of luminosity in Barn Owls Tyto alba. This page was last edited on 17 April 2019, at 17:10 (UTC).